For the second meeting in a row we had an unbelievably impressive icebreaker speech, that just blew us away. New member Alastair had us gripped with his tale of how he turned his life around after realising in his 20s that doing anything was better than doing nothing. Icebreakers are the 1st speech in the Competent Communicator manual and are an opportunity for our newest members to get in front of an audience and introduce themselves to the rest of the club. 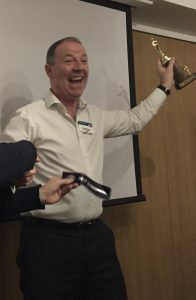 As you work through the manual you are encouraged to use movement, structure, vocal variety, props etc to enhance your speech delivery – so if Alastair was this good with his first speech then we cannot wait to see how he excels during his Toastmaster journey. We had an extended table topics session hosted by table topics master Andrew. The table topics master poses questions to the other members and invites them to come forward and give a mini speech, off the cuff, to answer them. Andrew asked seven questions of 15 that had been asked to some of the world’s leading lights in industry, and every member he picked answered them convincingly well. 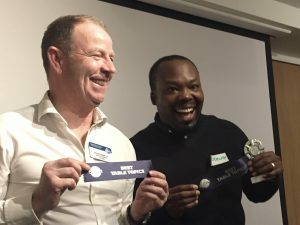 Competition for the Best Table Topics speaker was fierce, and we ended up with joint winners – Richard and Anthony Boboe. Not content with winning just one prize, Richard also took home the Best Evaluator award after giving a brilliant evaluation of Aparna’s excellent prepared speech. 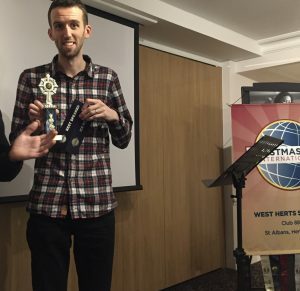 Richard is an experienced toastmaster who, in each meeting, in whichever role he takes on, teaches by example the best practices for being truly effective in the roles. The juxtaposition of the freshness of our new members and the experience and insight of our long time members is what makes West Herts Speakers so special. Everyone has their personal reasons for joining – for some it’s to get over a fear of public speaking, for others it’s about gaining confidence to speak in a foreign language, while others come to finesse their presenting skills. We’re already looking forward to our next meeting on 14th February and hope to see a full complement of club members. Well what else would we want to do on Valentine’s Day?